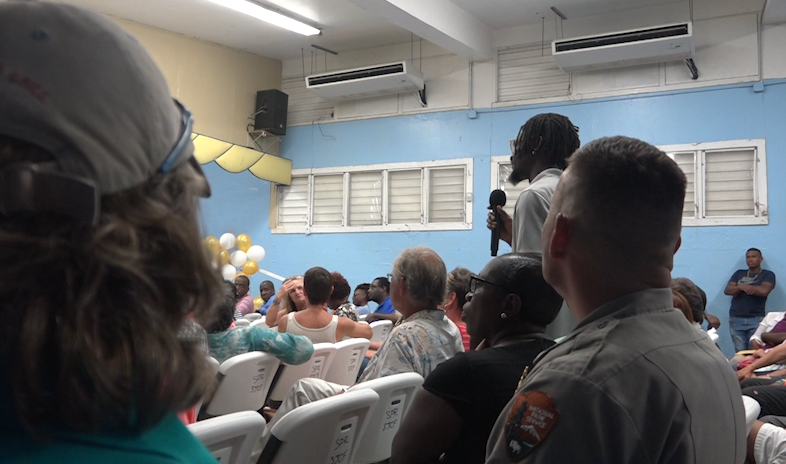 ST. THOMAS (CBS USVI) — While the meeting was initially set out to address the ongoing recovery after the storms it quickly turning into addressing even bigger issues. Issues that were here even before the storm even happened. “I am not going to be a proponent of sending my children to a different Island to be housed by I don’t know who,” Lorelei Monsanto said. Education was a big topic of discussion during Tuesday’s town hall on St. John with members of the Mapp administration. The sticking point was bringing a high school to the Island. Julius Sprauve School, the only public school in St. John, houses students in grades K-8. That’s where the town hall was at Tuesday October 23. “It needs to be all the way from Kindergarden to 12,” Eva Chinnery said. Eva Chinnery said she was born making that commute. Her mom had to take the ferry over to St. Thomas from St. John just to give birth at the hospital there. Chinnery said she was fortunate to get a sponsor to go to Gifft Hill School the private school on Island. But she’s concerned about those that don’t have that opportunity. That’s why she’s pushing Governor Mapp and Education Commissioner Sharon McCollum to get on board. Chinnery said Mapp and McCollum cited numbers of students for a barrier to the option. But other St. Johnians at the town hall said keeping the high school on St. Thomas is a good thing. “I feel like going to school every day by boat it just builds more character for me and helped me further on in life,” Artara Wilkins said. Wilkins grew up commuting to St. Thomas for school. She said, she didn’t mind it and said the variety of classes she received in St. Thomas, wouldn’t be possible in St. John due to space and staff. Governor Mapp said he is open to hearing more on this topic and is looking into a task force to find out if this idea is feasible.